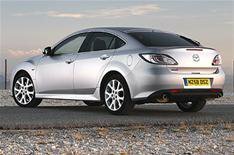 Driven: Mazda 6 2.2-litre diesels | What Car? Mazdas has installed a new 2.2-litre diesel engine into its 6 family car, and in the process has proved that you really can have cake, and if you want to have a munch, well, go right ahead. The 2.0-litre engine has long matched rival engines for economy and emissions, but has trailed them on performance and refinement. These 161bhp and 182bhp versions of the new 2.2-litre address all of that, helping the Mazda keep ahead of most of the pack and serving up tastier economy and emissions at the same time. The 182bhp version is decidedly swift and nearly 5mpg more efficient on the combined cycle than an equivalent Ford Mondeo. The 161bhp Mazda, meanwhile, is also no slouch and only the Volkswagen Passat has lower CO2 figures. The new engine is significantly more refined than the old 2.0-litre, no matter what the power output. Big drops in decibels make it a quiet motorway machine, and its flexible enough to require few gearchanges even if traffic slows down a bit and speeds up again. All models using this engine, bar one, slip below the 150g/km of CO2 level, so the vast majority of the new Mazda diesel family continues to live in the £120 a year VED band C and attract the same low company car tax bands as the VW. The one exception is the estate with the higher-power engine in situ, and even it puts out just 152g/km. Prices will rise, and although the top-powered SL-spec car will be £1000 more than the model it replaces, the 6 range continues to offer excellent value for money.